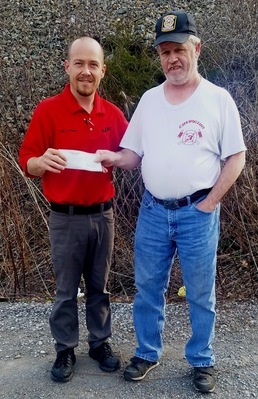 Covington Moose Lodge #610 has made a donation to the 23rd annual Alleghany Highlands Bike Rodeo that takes place at the Jackson River Sport Complex on May 4th beginning at 10 am. Here, Sgt. Chris Fisher, accepts the donation from Ricky Fridley, representing Covington Moose Lodge #610.